This flexible plugin is the market-leading extension for adding times to your WooCommerce store. These times can be used to restrict purchases to certain times or dates, or to allow or force the customer to choose a date and (optionally) a time (e.g. for delivery or pick-up), or to advise the customer of when his order will be fulfilled – and more. Ideal for stores with timed deliveries, restaurants, take-aways and anyone else who wants to restrict or allow customer choice of ordering and/or delivery times. To see screenshots of this plugin in action, scroll down the page. You can add as many opening/closing times you like each day/week, including one-off holidays and repeating annual holidays. 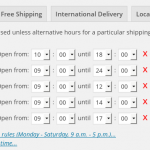 You can have different times for different shipping methods (e.g. one set for pick-up, another for delivery) – including compatibility with WooCommerce shipping zones (i.e. different settings for each shipping instance within each zone). You can make the times only come into play for specific shipping classes (e.g. if you have some products that are time-limited, whilst others aren’t). 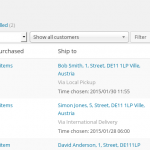 You can make configure extra times which only come into play for specific product categories (e.g. lunch-time only menu), and optionally have configurable messages displayed on the pages of items in that category out-of-hours. The customer’s choice (where there is one) is then shown both on the order email, and in the back-end with the order listing and order details. Note: Though this description talks about “delivery”, this is not essential – i.e. the plugin is not only for situations where you have physical deliveries, but for any situation where you want time-based restrictions. The plugin is fully internationalised (i.e. ready for translations). 41 different languages are fully translated for the front-end date/time picker (i.e. what the user will see), and a further 33 have all date terms translated (month and day names). For the back-end (i.e. what the shop owner will see), the current languages available are: English, Dutch, German, Spanish, Bulgarian, French and Italian (we have a website where you can quickly + easily add your own). It will also respect your WordPress timezone and time and date format settings. Tested and compatible with WooCommerce 3.0 up to 3.6 (which is the latest; an earlier release is available for older WooCommerce versions than 3.0 if needed) – and every version of WordPress which those plugins run on, and integrated with “WooCommerce Print Orders”, “WooCommerce Delivery Notes”, “WooCommerce PDF Invoices and Packing Slips” (Ewout Fernhout / WP Overnight) and “WooCommerce Print Invoices & Packing lists” (Skyverge / WooCommerce) (i.e. the selected time will be printed on their print-outs). N.B. 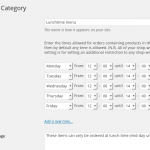 In current releases of the plugin, more sophisticated options for the “minimum order fulfilment time” are available, which allow you to do things like “you can have next day delivery, if you order before 5pm”. Current releases also allow you to make the holidays to vary between shipping methods – e.g. you don’t deliver on New Year’s Day, but you do allow pick-up. Instead of the sliders shown in the screenshot below, you can have a drop-down if you prefer. Note – the message is configurable; in this example, we were using the plugin on a restaurant site. Choose to have the times apply even with virtual goods (i.e. goods which don’t require physical delivery). e.g. If you wish to close your store on Sunday for all your products, whether they require shipping or not, then you can. Choose to apply your settings only if products from certain shipping classes are in the cart. i.e. 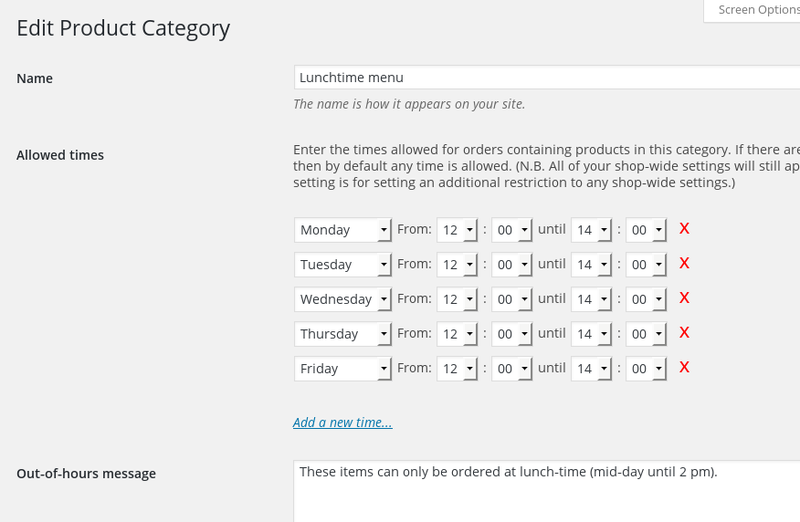 If your store sells mixed goods of different kinds, and if WooCommerce’s built in “virtual” attribute is not enough, then you can also use this option to decide which goods are subject to timing restrictions. Choose a maximum time (number of days) in the future that can be chosen. Choose a “minimum order fulfilment” time. 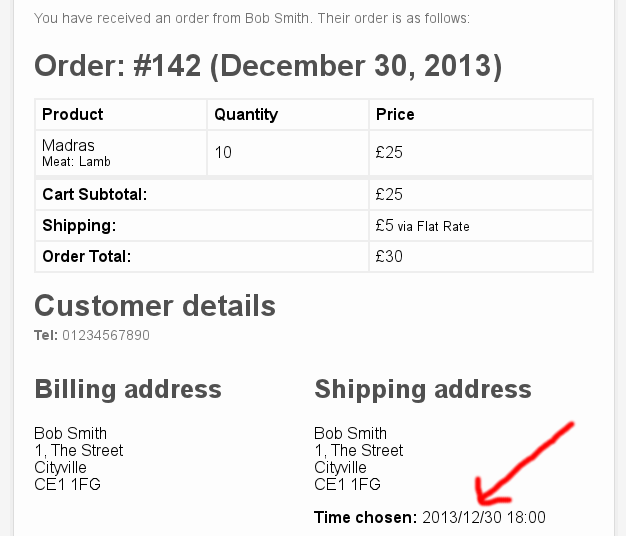 Times chosen must be at least this far in the future (and the default time suggested will fulfil this criteria). As you’d expect, if your shop closes for the day within this time period, then the customer will have to choose a time on the next available day (so, it can be used to enforce a “last orders for the day” time). This can be made to depend upon the current time of day – e.g. you can choose delivery tomorrow, as long as today it’s not yet 5pm when you order. You can also have different fulfilment times for different shipping methods. 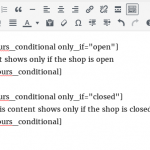 Use a shortcode (openinghours_conditional) to show content only if the shop is currently open (or closed). As is the norm with most WordPress premium plugins (and all official WooThemes WooCommerce extensions), your purchase not only includes the plugin, but access to new versions for 12 months. (After 12 months, you can carry on using the version you have installed; or you are welcome to purchase again for access to future releases). Firstly, please note that standard plugin support does not include hands-on assistance with customisations to the plugin that involve writing PHP code. There is an example, and links to tutorials, below. If you need to hire a developer to implement a PHP-based customisation, then we recommend Codeable, a marketplace of many WordPress/PHP developers who are available at good rates. A shortcode, [openinghours_conditional only_if=”(open|closed)”], is available. 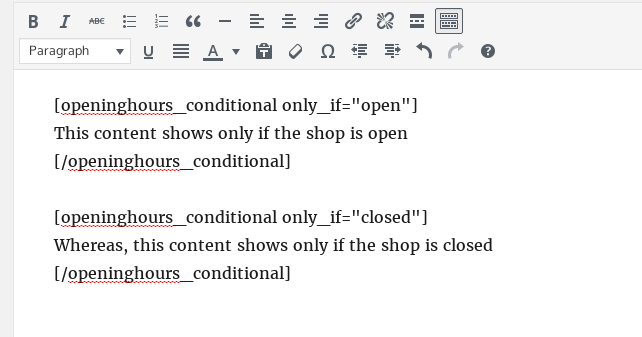 Content contained inside the opening and shortcode tags will only render if the shop is open/closed, according to your default opening hours (i.e. it does not depend upon considerations of category, or minimum order fulfilment times). e.g. [openinghours_conditional only_if=”closed”]The shop is closed now.[/openinghours_conditional]. Remember that you must exclude pages with conditional content from cacheing plugins. Further parameters are available to use the hours for a specified shipping method: shipping_method=”(shipping_method_textual_id|default)”, instance_id=”(shipping_zone_instance_id)” (applies only on WC 2.6+). The following filters (see here, or here for a tutorial) are available for developers to use to customise the plugin “under the hood”, in addition to the normal settings screen in the WP dashboard. (Continue to the bottom of this list for an example). Note also that the plugin is fully internationalised, and you can add your own translation using any standard tool (e.g. poedit) for creating translations. 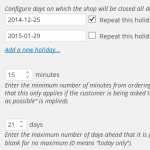 openinghours_chooser_position – controls the position that the time/date selector is shown on the checkout page. Strictly, this is the action call to listen for when outputting the selector. It defaults to woocommerce_after_checkout_billing_form. openinghours_frontendtext_timeavailable : The message to show when a chosen time/date is available. openinghours_frontendtext_timenotavailable : The message to show when a chosen time/date is not available. openinghours_notcurrentlyopenerror : The message to show when the shop is not currently open. 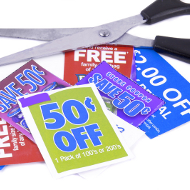 openinghours_shopsubjectnoun : The noun to use for describing the shop – e.g. “restaurant”, “take-away”; (defaults to “shop”). 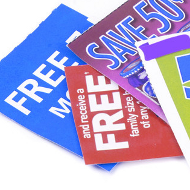 This value is then used in various of the following messages. 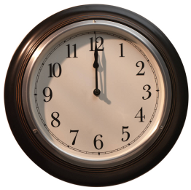 openinghours_label_timechosen : The label shown for a chosen time; defaults to “Time chosen”. Used on both the front-end and the back-end. openinghours_label_datechosen : The label shown for a chosen date (if in date-only mode); defaults to “Date chosen”. Used on both the front-end and the back-end. 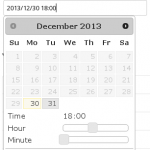 openinghours_timepickerformat: The time format to be used in the front-end timepicker. See here for a list of valid formats. openinghours_timepickercontroltype: The control type to use for choosing the time. By default it is ‘slider’, but you can also choose ‘select’ to use a drop-down instead. openinghours_next_opening_time: Use this to over-ride when the next opening time (relative to now) is. 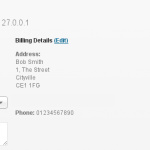 openinghours_frontend_initialvalue: Over-ride the initial value filled in in the checkout form field. openinghours_frontend_initialvalue_formethod: Over-ride the initial value filled in in the checkout form field for a particular shipping method (which is the second parameter passed to the filter). 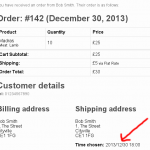 openinghours_date_only: Defaults to false; set this to ‘true’ if you wish the ‘time’ element to be dropped from the checkout date/time picker, and for only a date to be chosen. openinghours_forced_time: When openinghours_date_only is filtered to true, for the purposes of working out whether the chosen time is available (where relevant), the assumed chosen time defaults to 12:00 (i.e. mid-day). To change this, use this filter, and pass your results back in the format array($hour, $min). This allows you, for example, to force selection of tomorrow as the earliest available day, if it is too late in the day today. openinghours_jquery_ui_url: Use this to over-ride the URL used for the jQuery CSS style-sheet. 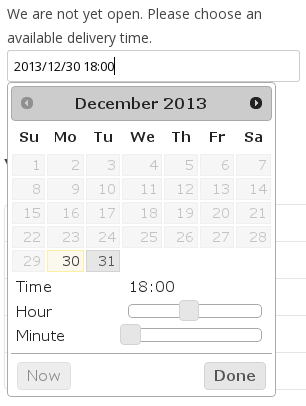 openinghours_datepickerformat_oneline: Set this to true (default: false) to use the timepicker’s “one line” style. To use this you must also set the control type (using the openinghours_timepickercontroltype filter) to ‘select’. openinghours_choose_soonest_time_on_shipping_method_switch: By default, if the customer changes shipping method at the checkout, then the chosen time will not be changed if it is still valid. However, if you prefer to automatically change the time to the soonest available, then change this to true (default is false). openinghours_category_message_prefer_parent_to_child: If a product is not available because of being in multiple nested categories which are both restricted, then this filter helps to choose which category’s message will be shown. If set to true, then it will choose the parent’s category message; if false (the default), then the child’s. openinghours_category_message: This filter allows advanced/arbitrary control over the ‘category forbidden’ message. 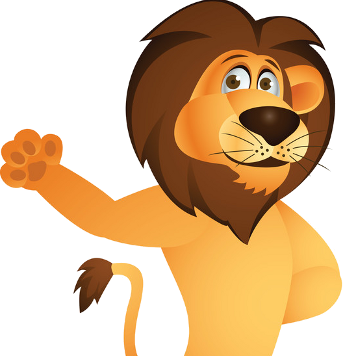 The parameters passed are the chosen message, any array of matching category messages keyed by category ID, and an array of IDs of parent categories, keyed by category ID. openinghours_multiple_category_handling: This filter controls how a decision is made about product availability if it is multiple categories with time restrictions. If set to ‘anyopen’ (default) then it requires availability in just one category; if ‘anyclosed’ then it requires availability in them all; ‘parent’ is suitable for shops where multiple categories only occur with nested hierarchies, and causes the parent’s times to be preferred; similarly ‘child’ for the child. openinghours_check_cart_items: This filter is called when the cart is being checked either at the cart page, the checkout, or processing the checkout. If you return true to it, then no notices or errors will be shown – i.e. it will short-circuit all other checks. openinghours_wpo_wcpdf_template_position: This filter affects the position that the chosen time is added to the template in the WooCommerce PDF Packaging Slips and Invoices plugin. 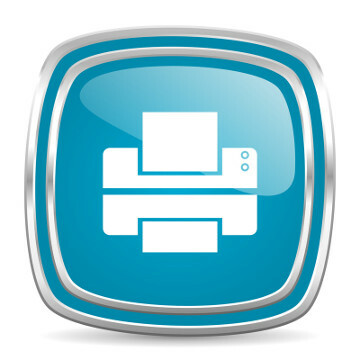 It defaults to: wpo_wcpdf_footer . To know what other values are valid, you will need to read the code of your chosen template from that plugin. openinghours_next_opening_time_with_gap : Allows a developer to over-ride the calculation of the next available time, taking into account minimum fulfilment times. openinghours_mingap_from_options: Allows a developer to over-ride the calculation of the minimum fulfilment time.